Let’s face it….life isn’t getting any less complicated is it. When you consider how hectic it can be with work, school, family, children, caring for our loved ones, and so much more, there are times you just want to sit down and melt into the couch, while life passes by. But, we can’t do that! Especially us busy moms! We must awake every day determined that this day we will make it through. But, have you ever wondered, “How can I make life easier for myself“. Especially in the KITCHEN! I’ve had that same question, throughout the years. In fact, I figured I spend probably about 3/4 of my day in the kitchen. I just got fed up with it and figured there has to be away round this. Well, there is and this year I discovered a way to save myself, TIME, MONEY, ENERGY, BRAIN CELLS & Resources. 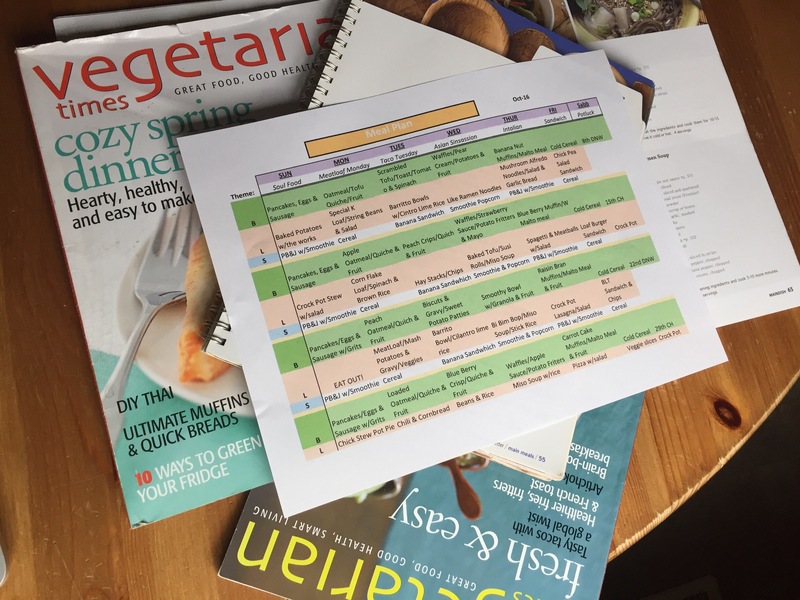 MEAL PLANNING! For years I would hear people mention it, and I often thought to myself, “I don’t need to plan my meals…I am a Kitchen Ninja“. You know, I can whip right in and whip right out! But….as the years have gone by and my family has grown by leaps and bounds, I found myself less like a Ninja and more like a Sliding Sloth! I had begun to hate being in the kitchen. There was so much that I had to do, that taking the time to go and figure out what meal to make, became so daunting and stressful. Standing and staring in the fridge, just hoping that something would be thrown at me so I didn’t have to figure out the food puzzle that was in front of me. Most of my shopping had no real rhyme or reason to it! It was just the aimlessly wandering down the grocery store aisle. Often times I ended up walking out of the store with more of what I didn’t even go there for, than what I needed to make the complete meal. It finally reach a point that I was fed up and finally decided to listen and try it out the meal planning. My first stab at it was a bit rough. I still had to put forth effort to find meals ideas that would fit my family, our taste and lifestyle. The internet proved to be a good source to start with. It was pretty easy to just type in a word….”Mexican”, and there came up a plethora of recipes and ideas to choose from. Eventually, I was able to make my way through and try other ideas like, Asian, Italian, Mediterranean and more. In the end, I was able to develop a plan that would work for my family, and it also became fun to do. My children and husband could join in and have more of a say so about what we ate from day to do, and also I began to not only meal plan, but prep food for the week. I now look back and can’t even imagine how I made it so long without doing it! It has given me a great portion of my life back. No longer am I sitting in the kitchen wondering like a lost ship, and my energy can be put to use on other things. It has also saved us a ton of money, that we really didn’t have in the first place. We went from spending well over $400 a month on a food budge, aimlessly wandering around in the grocery stores and eating out, to spending about $150 -$200 a month. Check out my video on YouTube (Large Family Small budget) that gives a bit more detail on how I manage to do this! If you think meal planning isn’t worth it, takes too much time, or won’t make a difference in your life….TRUST this BUSY wife, mother of 4, homeschooler, daughter, sister, church member, community service member, volunteer, friend and so much more…..it will give your time back, and allow you to spend it on the other important things in life. It’s all about PLANNING to WIN!